When God first started tugging my heart about our Christmas habits, one of the first things I was convicted about was how much we give during the Christmas season. To be honest, our family does not go crazy during Christmas with our spending. We have never spent thousands of dollars or wracked up credit card debt, but we have never really given much either. As I have been processing all of this, God has been tugging at my heart. Stasia, you should be giving at least as much as you are spending. "We don't have that much to give." "I will give when we have more." It is not about giving 10% and it is not about giving comfortably. It is about giving cheerfully and sacrifically. Tweet this! 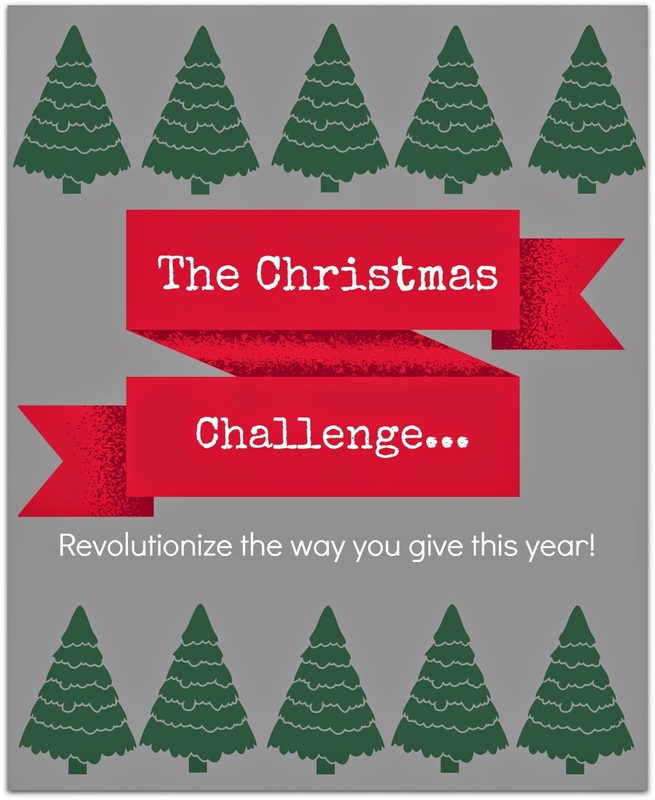 We have a budget for Christmas… and for every dollar we spend we are going to give away at least a dollar. To church, to missions, to charity. So where, where does that leave you? Give as much as you spend this year! Tweet this! I love this idea! I love giving gifts and sometimes go a little overboard without meaning to. We are expecting our first child in November and I don't want Christmas to be a materialistic holiday for us as we move forward. I look forward to the rest of the series. This rule of making giving equal to Christmas spending makes for an awesome goal! I think our Christmas will be very low-key this year since it's just the two of us. Love this!! Our pastor is doing a series on finances and he says that yes 10% is so important but really EVERYTHING all 100% is God's money and we need to consult him and feel his leading in what to do with it--it really convicted me on all the "extras" of stuff I buy that I don't really need! I totally agree… it is not what we do with the 10%, but what we do with the 100%. God is concerned with our heart and how we use all the money He has given us! I love this idea! Thankfully giving doesn't have to be only monetary. We can give with our time too! And, sometimes, giving up our time is even harder than giving up our money. Looking forward to keeping up with you during this challenge! Great job! Totally agree… at least one of the posts is definitely going to be about serving! Ooh! I love this! We always have a budget per person because we use to go way overboard! But, since we have a million nieces and nephews now and our own son, we had to establish a budget! I love the giving back thing. Our church always does an Angel tree to give presents to kids that don't get presents every year. I like the idea of giving to a charity too! My favorite thing to do is make a homemade gift. It means so much more because it comes from the heart; and it cuts the budget in half sometimes! Thank you for sharing! We do a budget per person usually too! W also love to make presents! Hi Stasia! This reminds me of the huge TV my husband wants to buy. I told him that if he buys one, we will have to give 1/2 the price to charity. You have the same idea, but amped up quite a bit! I hope you will be blessed for your sacrifices. Thanks Ceil! And thank you for coming by! I loved that post… it was one of my inspirations! This is a beautiful idea! My husband and I haven't really kept track of the numbers of spending/giving (outside of Mint), but December is when we do a final push of charitable giving. While giving should definitely come from the HEART, giving in December is also practical for tax purposes. At the end of the year is when we can figure out the extra money in our budget and then give it away. That is great that y'all do a final push in December. I love what you said about examining the heart in giving too! I LOVE this concept and am completely on board. One thing I would add is how important it is to evaluate the charities to which we're giving... unfortunately not all charities are created equal and some just eat money and offer little impact! It's one more step in being a good steward of our resources. Thanks for sharing this, friend! So true… that is one f the biggest challenges to me as well. I is so important to pray through and research where we are giving! This is SUCH a good post! I love it...we just wrapped a series on tithing at church...SO so good, and what a great concept to continue to practice. Being a good steward is such an important part of our faith! This is so inspiring! We may have read that scripture multiple times but this really hits home again! I feel bad that this hasn't occurred to me prior! With my 12 year old we have been trying to incorporate more ways to give back and this will definitely be something we discuss. What a great concept. I had never looked at Christmas spending with that in mind. Thanks! What a wonderful heart you have here Stasia. God is pleased. A hard concept for many to put into action. Whether it be our gifts of money, time, or even our hearts, it is the cheerful attitude I feel is what is important. God loves a cheerful giver. Thanks for sharing this important biblical principle on Tuesday Talk this week.